Ranu and Brinkman are being supported by Lucent to work on this project. We are working to bring aboard another MSEE student, Tom Alferink, to help develop the DSP engine, but may have hit a funding snag with him. Also, we are fortunate to have the continued support of Bob Dixon's Radio Observatory volunteer group, which provides a source of enthusiastic labor for field testing, help in various construction problems, and has also donated several thousand dollars in the form of equipment purchases and travel support. Brian Baertlein and Jeff Brinkman have made good progress in this area. Brian has written a status report on antenna development. We are currently agonizing over several options for LNAs. One option is to use 50-ohm connectorized wideband LNAs (made by Miteq, among others) that have recently become relatively inexpensive ($400 each or so) and would greatly simplify things for us. The downside is their mediocre noise figure (about 2 dB or so at 2 GHz). Another option is that we now have some custom designs for LNAs which have better noise figure (around 1 dB), are ultra-low cost, but only cover about half of the tuning range. This might be the way to go if we follow Brian's suggestion that we develop an array geometry that packs "high band" elements in between the spaces between the larger "low band" elements. The downside is much more labor effort to construct, test, and maintain 128 LNAs. Fortunately, this is does not appear to be a critical path item for the project, so we have some more time to think about this issue. The current receiver design splits the tuning range into two bands. The 900-2000 MHz "high band" is downconverted directly to a 600 MHz IF. The 300-900 MHz "low band" is upconverted to 1575 MHz and injected into the high band signal chain (1575 MHz is selected to allow us to exploit ultra-cheap GPS components). The 600 MHz common IF is downconverted to 70 MHz using a Watkins-Johnson HMJ5 FET mixer, undersampled by a AD6640 12-bit A/D at 50 MSPS, and further "tuned and zoomed" by a AD6620 digital downconverter/channelizer. After some horse trading with the various suppliers, it appears that we will be able to build 64 of these within our budget. We have designed and tested a version of the HMJ5/AD6640/AD6620 signal chain that we are happy with, and are now focussing on the LNA+RF strip. The Argus receiver design will be Emarit Ranu's MSEE thesis topic. The design concept and testing to date is documented in a technical report (531393-2). Steve Ellingson presented pieces of this at Dwingeloo and in the proceedings paper, which was also sent to Ly Ly for the USSKA web site. It looks like this approach is a reasonable way to get started, but we are still concerned that the cost for 64 elements is too high, at least without making some painful tradeoffs such as limiting duty cycle or bandwidth. We are working hard to try to entice a suitable vendor to offer a sufficiently large price reduction to put this option in reach. An alternative is to consider off-loading signal processing tasks onto ASICs and FPGAs, which we regard as a last resort. Another small effort is underway to look at radically alternative approaches along the lines of Beowolf, which uses lots of cheap PCs inteconnected by SCSI or some other suitably high-bandwidth, low-latency connection. We are continuing to study the array calibration problem. Fortunately, we are mostly immune to the I-Q calibration problems NFRA is wrestling with, because we are are using a digital quadrature demodulation scheme. We also suspect we have it a little easier with respect to mutual coupling, which should be much easier to deal with for the kind of arrays we now have in mind (see Brian's report). We continue to feel confident about being able to use a mix of GPS and GLONASS satellites around 1500-1700 MHz for array calibration. Getting good calibration at other frequencies, however, needs some more study. We recently did a study on rolled edge design for planar arrays. The motivation for rolled edges is that one can reduce the pattern ripple due to edge diffraction using a rolled edge as opposed to simply truncating the ground plane. What is not commonly realized is that the rolled edge results in a dramatic increase in gain along the plane of the ground plane (i.e., toward the horizon), which is not good from an RFI perspective. We have worked out an electromagnetic analysis of this problem, and so now at least we can calculate the elevation gain patterns and assess the tradeoffs. NFRA (possibly others as well) have also indicated an interest in using rolled edges for their arrays, so we hope to generate a report on this topic soon. This is a simple array receiver system that we have developed as a testbed for various parts of the Argus design. The UAX antenna consists of 7 monopoles arranged in a "Y" geometry on a groundplane mounted on the roof of our building, and is designed for terrestrial observing. The RF front end is limited to a few MHz in the 460-470 MHz region, but uses the HMJ5 IF strip and the undersampling architecture described above. The digital output is captured using a bank of 16 Ksample FIFOs and downloaded to a PC using low-speed, non-real-time digital I/O. The purposes of UAX are the following: (a) Gain field experience operating in a noisy section of the spectrum of interest (and believe me, 460 MHz around here is BAD! ), (b) Proof of concept of IF strip / Digital receiver design, (c) 460 MHz is available for 0.5W unlicensed transmission, so we have an opportunity to do some testing of array processing and RFI monitoring/rejection schemes in a controlled way, (d) Work through some calibration algorithms, and (e) Test of the Argus rack construction & power system design. Currently, we have two channels of this system built, with the remaining 6 to be completed by the end of this week. The system will be exercised through the summer and fall using controlled sources mounted in vehicles. The plan is to evolve UAX into Argus through a series of modifications over the next 9 months, testing one new concept at a time. 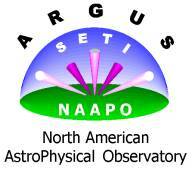 A concern we have had in developing Argus is how we can test our receivers to ensure that they are "astronomical grade". This turns out to be difficult problem because the kind of equipment we would need to do this testing on the bench effectively would easily dominate the cost of the entire project! On the other hand, waiting until the receivers are integrated into a large array is not really a reasonable option, because by that time it will be too late to modify the design. As an alternative, we have decided to set up a small L-band radio telescope at ESL using a converted 10-foot TVRO dish. The idea is that we can test receivers using known source observations, and in the process gain confidence that they are good enough for this application and do not suffer from some hidden pathology that might otherwise surprise us down the road. Further, this gives the means to train newcomers to the project in some of the basics of radio astronomy. Ken Ayotte has made the necessary modifications to the dish, installed it, designed and built a feed horn, and is currently using the "Argus-II" 4-channel system that we built last year as the receiver. The system came on line on June 29 and we had confirmed an excellent drift-scan observation of Sag A the same night. Ken is now working to put together the software we need to use astonomical sources as sensitivity benchmarks. An interesting side benefit of this system is that we acquire four channels of coherent, predetection receiver output in digital form on a PC. So, for example, we could look at 4 frequency bands simultaneously, or we could use the other 3 channels for RFI monitoring, time-domain RFI suppression, and perhaps even sidelobe canceling. ESL recently joined the USSKA consortium on behalf of OSU. Also, Ellingson became a charter member of the International SKA RFI Working Group, and is now collaborating with Allan Roy (with the VLBI group at Bonn) to de-jargonize (or perhaps re-jargonize?) the signal processing literature on this topic for application to radio astronomy. At Rick Fisher's invitation, Ellingson is presenting a paper on this topic at the Toronto URSI GA in August. Conference: S.W. Ellingson, "A DSP Engine for a 64-Element Array" [PDF file], Technologies for Large Antenna Arrays, Dwingeloo, The Netherlands, April 1999. B. Baertlein also attended. Other Travel: S.W. Ellingson to USSKA consortium inaugural meeting at MIT, May 25, 1999. Copyright © 1996-2005 Big Ear Radio Observatory and North American AstroPhysical Observatory. Last modified: August 19, 2005.